The plan Qualité Tourisme was initiated during the interdepartmental comity of September 9, 2003. To enhance France's image and to develop jobs and create wealth, quality has become the priority for all the federated players of tourism. Hotels, restaurants, campsites, cafés, brasseries, seasonal rental agencies, tourist centers... already many professionals like the Le Moulin de David campsite have mobilized themselves and bear the badge Qualité Tourisme. 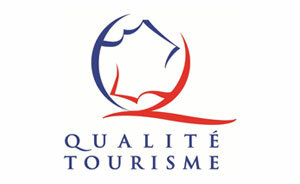 ... for that the organizations who follow these measures get the badge Qualité Tourisme™. and follow the regulatory rating if it exists. provide for the putting at disposal of a customers' satisfaction questionnaire in each establishment. Qualité Tourisme™ is a brand which federates the rigorous quality measures taken by tourism professionals like the Le Moulin de David campsite whose main objective is the quality of service for the customer's satisfaction. Patented by the ministry delegate for Tourism, the brand Qualité Tourisme™ is, for us as well as for our customers, a guarantee of trust.